influencing people towards people and make them to buy your products like a real business man do but in online marketing any one can take chance. 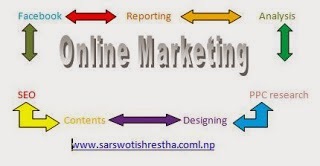 To earn from online marketing you need to have a solid product and it is better that is of your niche. You can make tons of money from online marketing through solid niches. Well many people are joining online marketing and there is really a terrible competition in online marketing but just you don’t fear from that with good tools and with good knowledge you can have a solid income. Before taking any product in online marketing you should make some survey about how much will be the demand of the product or service at your niche and only take those products in online marketing which have positive response from the customers. You can use a powerful trend research tool that may help you in trend research. Those tools inform you about the best hottest trend in the online market and also about the hottest PPC (Pay Per Click) campaign across the world in the web. You can also know the recent keywords used by the search engines and users. Such tools are really helpful in internet marketing so I suggest you to have one of them. Analysis is very much important is online marketing. You should have the capability of strong analysis about how can you increase traffic to your product, promote it and ultimately sell it. It looks complicated right and it is to some extent without proper tools and knowledge you may lost. So you need to have a great determination and proper knowledge. If you don’t have enough bucks to buy the tools for online marketing then you can use the free services provided by various sites. For instance you can use Facebook and blogspot for online promotion of your product. Similarly write reviews through about.com or squidoo.com and earn a heavy traffic. Just you need to have a great interest and determination then you can do it easily. Just make sure you don’t lose your passion. Well there are lots of free seminars and discussion going on about online marketing join them at your niche and know more about online marketing. But beware of scams going on there which influences you saying they provide training and throw you at the rubbish. 1. Raven tools: This tool is for online marketing that helps you to do various tasks related to online business like SEO management, PPC research, Social Media Monitoring, Reporting, SEO research, SEO competitor analysis, content management and finally tasks and messaging. This is the trusted tool by millions of online marketer. You can test it having 30-days free trail. 2. Internet Marketing Ninjas:- Many search engines has come and gone so are you confused what works then. This can be the best tool for you for SEO management. It really helps to convert small business to major brand. It is a good tools that helps you in SEO, designing, PPC ,content, link building, helps in expanding your business, increase your rank in search engines and also helps to create a unique trustworthy customers. These are the best tools for the online marketing that make your business reach the climax. Try it.